I live in Nicholas Soames' constituency, Mid Sussex, and even if I could vote as often as a Birmingham Labour councillor it wouldn't move him an inch closer to being thrown out on his ear. -- I understand (though I have not checked) that this effect is due mostly to quirks of demographics, of which the one most usually advanced is that Labour constituencies tend to be more urban and that, as technology changes, towndwellers are fleeing their lives of urban squalor, and exchanging them for lives of whinging about fox-hunting, driving SUVs down country lanes at break-neck speed, and the other trappings of rural squalor. Apparently the Boundary Commission can't keep up and the result is that the median Labour constituency gets by with only 66,000 electors while the median Tory constituency has about 72,000. This fact, no doubt, warms the hearts of the many Labour MPs who benefit from it. 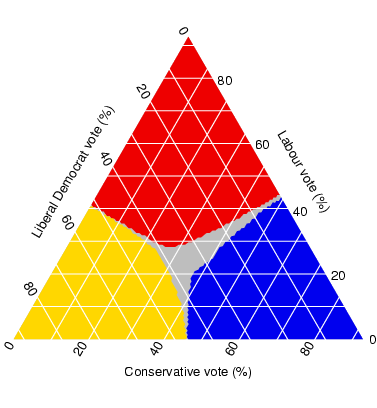 For our purposes this diagram shows two important things: firstly, it is not symmetric under the exchange of any two parties -- the electoral system treats some of the major parties better than others; secondly, there are many points where a minority of support for a given party in the electorate will nonetheless yield a Parliamentary majority for that party. They break the link between constituent and MP. A system of proportional representation would put an end to Labour's Parliamentary majority. One very sensible argument for the first of these (thanks to Martin Keegan for forcefully articulating this to me) is that an election should be viewed not as an aspirational exercise in the choosing of a future government but as a referendum on the conduct of the previous one. In order to achieve this electors ought to be in a position to sack their MPs. The charming notion here is that politicians will eventually learn by association that they ought not to annoy the electorate too much. Many proportional representation schemes (like the utterly wretched one used in the European elections) rely on a party list; when support for a party falls, the representatives who lose their jobs are those which the party has placed lowest on the list, not those whom the electors think have done the worst job. For many advocates of the existing system, the election of single MPs in single constituencies is a requirement that any future system should maintain. My proposal is designed to achieve this, while also managing to be perfectly proportional. Instead of varying the electoral system in the country, I propose that to modify the conduct of divisions in the House of Commons. For the purposes of mental arithmetic, each Labour MP is worth roughly 2/3 of a seat, each Conservative MP 1 1/4, and each Lib Dem 2 2/3. There are various corner cases which one should treat. 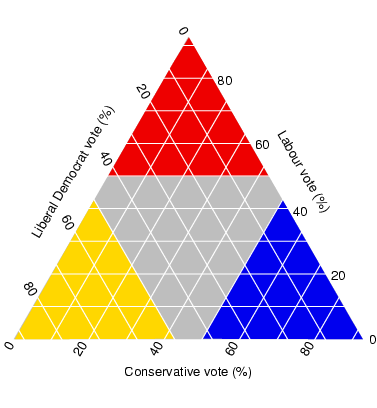 Independent MPs are easy to handle (treat as single-member parties -- for instance, Dr Richard Taylor would have had a voting weight of 0.71); harder are the cases of parties splitting or merging, or (as a special case) defection of an MP. Obviously one -- attractively simple -- possibility is for an MP to carry their voting weight with them for the duration of each Parliament, but that may not strike the right balance between support for an individual candidate and for their party. Similarly, a by-election can be treated as the election of an independent, or the new MP can be given the voting weight of the party they are joining. Anyway, these details don't affect the system fundamentally. I agree that this is a Bad Thing, but (a) the damage is already done -- see European Elections passim; and (b) it is obviously true that many voters vote for parties not people, and, however much we despise this, we must accept it. True. However, MPs are paid almost £60k a year and (Government) whips get an extra £25k on top of that. For those sorts of prices, occasional resort to mental arithmetic ought not to be out of the question; and if the arithmetic becomes too taxing, MPs' expenses budgets (£118k, on average) can probably stretch to the cost of a pocket calculator. I.e., different MPs should not have different amounts of power. Well, the whole point is that they should -- because of the vagaries of the system by which they are elected. It's more important, goes the argument, to have one elector: one vote than one MP: one vote. Possibly, but if so I haven't spotted it. Actually, of course, as with all electoral-reform suggestions, the latter is the most important objection in practice. Such a scheme could only be implemented by a government with a majority in the House of Commons, and so -- since it would almost certainly result in that government losing its majority in the next election -- no rational government would implement it. Consider a completely toy model. Suppose that you are in charge of one of two major political parties. Suppose that you derive benefit +b per unit time from being in power, benefit -b from the other major party being in power, and, on average, 0 from a hung Parliament where policy-making is by deals between the two major parties and other smaller parties. Suppose further that, owing to (waves hands) demographic change and stuff, power alternates between the two major parties, with each being in power for time T before being swept away to make space for a period of T under the other government. Finally, suppose that at any point during this cycle when you are in power, you can pull the plug on the whole thing and replace it with a proportional electoral system which will ensure a permanent hung Parliament. Would it ever be rational to reform the electoral system? In unrelated news, I hear that the Labour Party has inserted a pledge to review the electoral system during its third term into its manifesto. Update: a couple of things I forgot to mention while writing the above. Firstly, if you're looking for arguments against the proposed scheme, consider the incentives which apply to parties campaigning in particular (e.g. 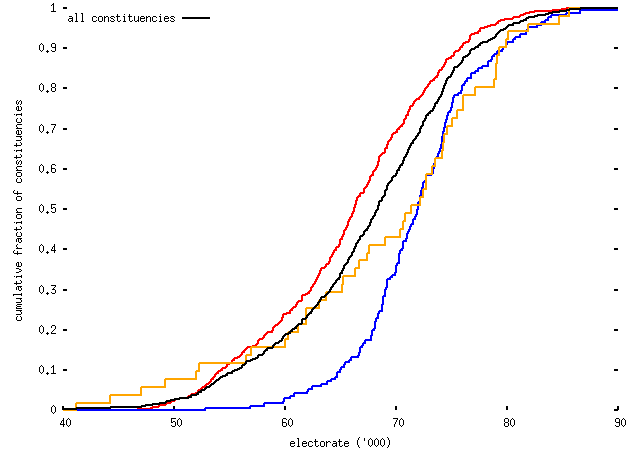 marginal) constituencies. 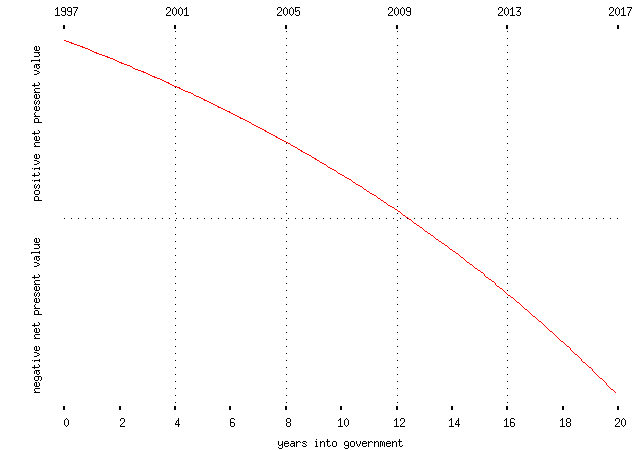 Secondly, I should probably say that my twenty-years-of-one, twenty-years-of-the-other model of British politics is probably an unjustified extrapolation, but from here it certainly looks as if the Labour Party will be in power for a while yet. A third comment: implicitly my scheme requires that, to achieve any influence, a party must be able to have a single MP elected somewhere. Most proportional-representation schemes require a party to reach some threshold -- say, 5% of the total vote -- before getting any representatives elected; in my scheme you have to be able to win a single constituency. That requirement is, of course, a consequence of demanding a link between constituencies and MPs; in any case, it seems a reasonable way to keep the nutters out of power.